So I just install a e3d v6 into my Boxzy printer. After I update the firmware and PID autotune it, I can still print PLA, but I notice the temperature was 2 degree below the temp I want. So I tried other filament that need a higher temp and the heater wont reach the temp (2 to 5 degree below) and the printer just don't start. For example, I print PETG at 250 degree but the heater only heat to 245-247 degree so the job will not start. Now I can only print before preheat to 255 degree and start the job. Does anyone know where is the problem ? You see power does not get up as required. Typical reason is that drive max is still on 130/180in configuration limiting the I part of pid controller. Increase that value to what you need. looks like 24V heater powered with 12V only. can you measure heaters resistance? That looks wrong. You have set pwm max values to 255 but even when heating is low it seems you are only using 25% of the power. Is this correct? If you set heat manager to 0 does it also limit to 25% power? There it uses PID max value and that is according to eeprom 255. Is this the original firmware or some forked and modified version? If it was modified for 24V on 12V heaters it would explain it. So I guess i fix it now by increasing the value of PID drive min from 70 to 140. Work fine now ! Thanks for the help !!!! drive min should not be the problem. Only the fact that you seem to not get over 25%. With high drive min you might get problems with lower tempertures. YOu now just force the high value also max is even higher and was no real limit. 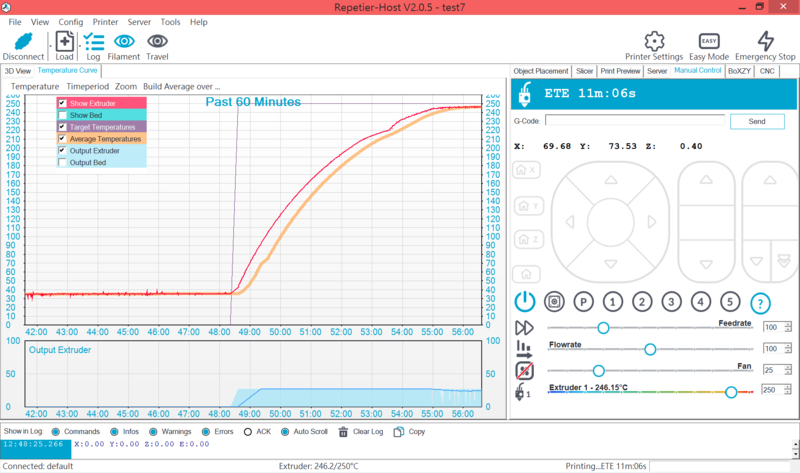 So I was finally fix the heating problem by using an unofficial firmware made by another Boxzy user, a new problem occurred. 00:39:07.655 : Warning: Seems like we missed a ok, got a wait - continue sending. 00:39:10.703 : Warning: Seems like we missed a ok, got a wait - continue sending. 00:39:13.754 : Warning: Seems like we missed a ok, got a wait - continue sending. 00:39:16.801 : Warning: Seems like we missed a ok, got a wait - continue sending. 00:39:19.848 : Warning: Seems like we missed a ok, got a wait - continue sending. 00:39:22.895 : Warning: Seems like we missed a ok, got a wait - continue sending. So do you know what is happening ? You only show 30% of communication. For analysis always use the real log to a file or at least activate all log parts. Also always start with the good part so we can see how bad part evolves. From the messages it seems like firmware is not sending all "ok" responses. Maybe related to the error message wanting a value 0-255 but gets always resend the same value. Never seen this error. Sorry I am not really familiar with the log, so here is the log. < 12:54:06.725 : Object is manifold. < 12:54:06.727 : Analysing finished. 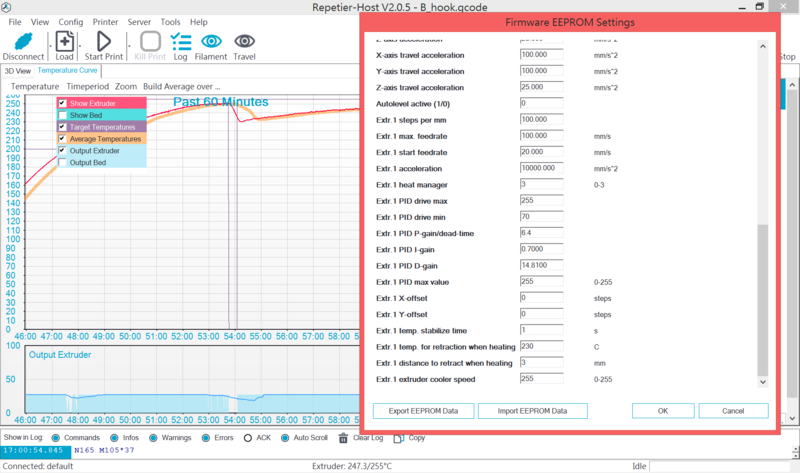 < 12:54:09.893 : CuraEngine command:D:\Repetier-Host\plugins\CuraEngine\CuraEngine.exe -p -v -c "C:\Users\YT Piko\AppData\Local\RepetierHost\cura.ini" -s posx=0 -s posy=0 -o "C:\Users\YT Piko\AppData\Local\RepetierHost\composition.gcode" "C:\Users\YT Piko\AppData\Local\RepetierHost\composition0.stl"
< 12:54:09.929 : <CuraEngine> (at your option) any later version. < 12:54:09.929 : <CuraEngine> GNU Affero General Public License for more details. < 12:54:09.929 : <CuraEngine> along with this program. If not, see <http://www.gnu.org/licenses/>. < 12:54:10.029 : <CuraEngine> Wrote layers in 0.08s. < 12:54:10.029 : <CuraEngine> Wrote 93.2 kilobytes. < 12:54:10.029 : <CuraEngine> Total time elapsed 0.09s. < 12:55:38.228 : Warning: Seems like we missed a ok, got a wait - continue sending. < 12:55:41.275 : Warning: Seems like we missed a ok, got a wait - continue sending. < 12:55:44.322 : Warning: Seems like we missed a ok, got a wait - continue sending. < 12:55:47.373 : Warning: Seems like we missed a ok, got a wait - continue sending. < 12:55:50.421 : Warning: Seems like we missed a ok, got a wait - continue sending. < 12:55:53.468 : Warning: Seems like we missed a ok, got a wait - continue sending. < 12:55:56.515 : Warning: Seems like we missed a ok, got a wait - continue sending. < 12:55:59.562 : Warning: Seems like we missed a ok, got a wait - continue sending. < 12:56:02.614 : Warning: Seems like we missed a ok, got a wait - continue sending. < 12:56:05.661 : Warning: Seems like we missed a ok, got a wait - continue sending. < 12:56:08.708 : Warning: Seems like we missed a ok, got a wait - continue sending. < 12:56:11.759 : Warning: Seems like we missed a ok, got a wait - continue sending. < 12:56:17.985 : Warning: Seems like we missed a ok, got a wait - continue sending. < 12:56:21.032 : Warning: Seems like we missed a ok, got a wait - continue sending. < 12:56:24.288 : Warning: Seems like we missed a ok, got a wait - continue sending. Try disabling "Send ETA to printer display" in printer settings. I think that gets parsed wrong causing the error. Oh this time it really works !!!!! Really appreciate the help, finally can print without any problem. Thanks !!!!!!! !